The veins have crescent-shaped valves at longer intervals in the lumen that divide the long vessels into segments. These valves open as soon as the blood is pressed upwards towards the centre of the body against gravity and close in the instant that the blood comes to a "standstill" and would start to flow backwards. Intact valves prevent the blood from pooling in the periphery (particularly when standing) and absorb the forces that act on the veins under stress (walking, jogging and jumping). 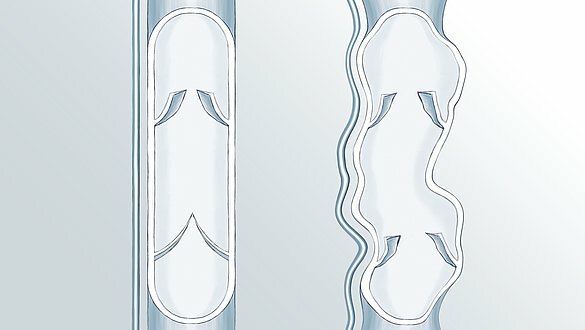 The communicating veins also possess valves that prevent return flow from the deep to the superficial venous system. If the functionality of the valves is impaired, or has even been destroyed, by injury or after inflammation, the work performed by the leg muscles sometimes presses the blood towards the heart in the subcutaneous veins instead of in the deep veins. This results in overstrain of the superficial venous system. The symptoms of this are stasis and oedema, in the long term this can develop into chronic venous insufficiency (CVI). Once destroyed, venous valves remain defective. However, valves that have only lost their function can regain their functionality, at least in part, with consistent compression treatment.